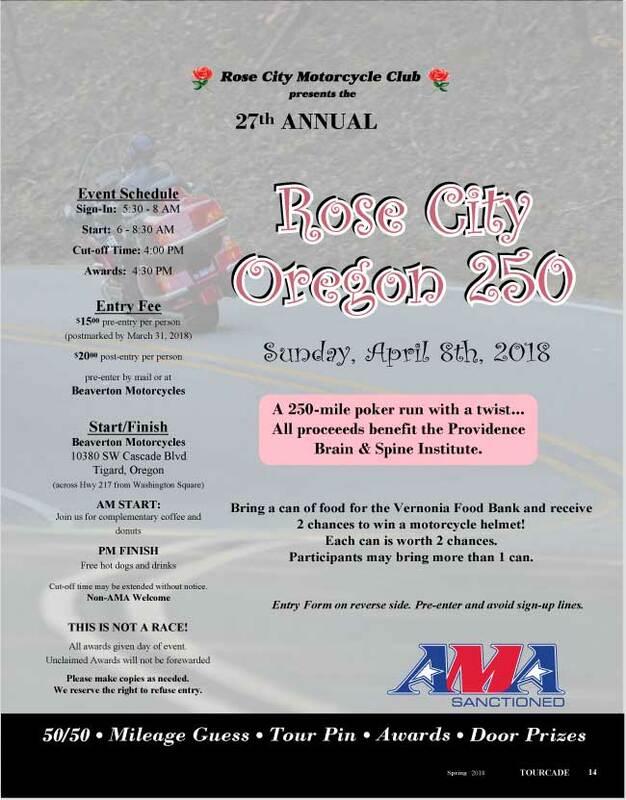 The Rose City Oregon "250" is a poker run for road riders. Approximately 250 miles in length, it serves as an excellent opportunity to tune-up for the Rose City Oregon 500 in May. The "250" will again benefit the Providence Brain Institute as well as the Vernonia Food Bank. Last year raising over $5,000 in contributions to the Providence Brain Institute for research and patient support and also, adding almost a ton of food to the Vernonia Food Bank. The first 22 years of the Rose City Oregon 250 charity event has been a huge success! The 9,000+ participants, traveling over 2.2 million fun filled miles, have made it possible to donate over $50,000 to the National Kidney Foundation and 10 tons of food for Vernonia Food Bank. Here is an ENTRY FORM that you can print. The 28th Annual Rose City Oregon 250 will be held on Sunday, April 7, 2019. Sign-in and start will be between 5:30 a.m. to 8:00 a.m. at Beaverton Motorcycles located at 10380 S.W. Cascade Blvd., Tigard, Oregon (Across Highway 217 from Washington Square) - Take the Greenburg Road Exit from Hwy 217. In one block turn right at the 76 station and continue for about three blocks to Beaverton Motorcycles. Want directions to the Beaverton Motorcycles? Here is a MAP. The Cut-off time is 4:00 p.m. and awards will be presented at 4:30 p.m. In case of a tie the earliest entry wins. Unclaimed awards will not be forwarded. Entrants will receive the ROSE CITY OREGON 250 tour pin and/or year bar and route card. The checkpoints, which will be unmanned, are on the official route card. All participants are urged to strictly observe all State and Local traffic laws. SUGGESTIONS FOR ENJOYING THE TOUR . . .
Ride in groups of two to four motorcycles. A large group will slow you down at gas stops, rest stops and checkpionts. STAY DRY WITH RAIN GEAR. This is Oregon in April. Dress WARMLY. You can always take it off, but you can't put it on if you don't have it with you. Rose City Motorcycle Club believes that motorcycling is a family sport and we welcome children and young adults at our events. For this reason, we will provide a Notary Public for your convenience. A NOTARY PUBLIC WILL BE PRESENT AT SIGN-IN.